A farmer thought it was only a wood, but when they pulled up they were totally shocked what they found! Farmer James Bristle and his neighbor were digging a trench to install a drainage pipe in his wheat field on the outskirts of Chelsea, Michigan, when their backhoe all of a sudden struck something hard around eight feet underground. At initially, the pair thought they had hit a buried bit of wood, maybe a fence post, however they soon realized they had revealed something neither had ever seen before, an enormous three-foot-long bone. “We didn’t know what it was, but we knew it was certainly a lot bigger than a cow bone,” Bristle stated. Trusting the interesting object may have been a dinosaur bone, the farmer contacted the University of Michigan Museum of Paleontology, located just 10 miles from his field. Daniel Fisher, a professor and director of the University of Michigan Museum of Paleontology, arrived at Bristle’s farm last Thursday with a team of 15 students to investigate the relic. With time of the essence because of a tight harvest schedule, Bristle gave the team of paleontologists only one day to complete their work before he needed to resume his drainage project. So at dawn’s early light, Fisher’s team—with the help of two local excavators—began to dig a 10-foot-deep excavation pit. Working briskly, the paleontologist soon discovered that Bristle’s farm contained the remains of a prehistoric mammoth. Curious locals gathered throughout the day as news of the discovery spread. By sunset, without a break to eat or drink, the crew had excavated approximately 20 percent of the bones of the prehistoric elephant-like creature. Using zip lines attached to a backhoe, the paleontologists carefully hoisted the mammoth’s gigantic skull and tusks and placed it on a flatbed trailer along with the skeleton’s vertebrae, ribs, pelvis and shoulder blades before filling in the pit. Mammoths roamed North America until their disappearance about 11,700 years ago, and the remains of only 30 of the massive prehistoric animals have previously been found in Michigan. Fisher told the Detroit Free Press, however, that no more than five of those skeletons have been uncovered as extensively as the one they found in Bristle’s field. The mammoth’s remains still need to be dated, but Fisher said the bones are from an adult male that likely lived between 11,700 and 15,000 years ago and was in its 40s when it died. The paleontologist said the specimen was a Jeffersonian mammoth—a hybrid between a woolly mammoth and a Columbian mammoth named for founding father Thomas Jefferson, who had a keen interest in paleontology. Fisher noted there was “excellent evidence of human activity” associated with the mammoth remains, and he theorizes that ancient humans carved the animal and submerged the carcass in a pond to preserve the meat for later use. “We think that humans were here and may have butchered and stashed the meat so that they could come back later for it,” he said. The evidence included three basketball-sized boulders found with the remains—which may have been used to weigh down the carcass—a stone flake resting next to one of the tusks that could have been used as a cutting tool and the positioning of the neck vertebrae in correct anatomical sequence as opposed to a random scattering that normally happens after a natural death. 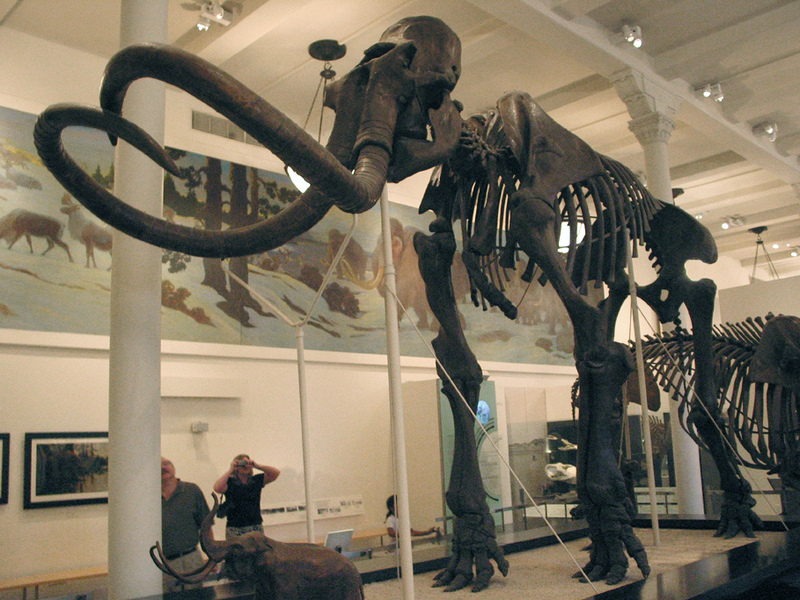 Bristle has agreed to donate the mammoth’s bones to the University of Michigan for further study. The paleontologists will wash the specimen, which will be known as the Bristle Mammoth in honor of the farmer, and check for cut marks that could confirm it was butchered. If there is evidence of human consumption of the mammoth, the eventual dating of the bones could help to push back the date of the earliest known habitation of southeast Michigan. Fisher hopes to display the bones at the University of Michigan Museum of Natural History, possibly combined with fiberglass casts of bones from other Michigan mammoths to form a complete skeleton. Share your thoughts in the comments box! Don’t forget to like Philippine VIral on Facebook for more news and updates! I Thought This Was Just A Church From The Outside, But When You Go Inside… You Will Be Surprised!